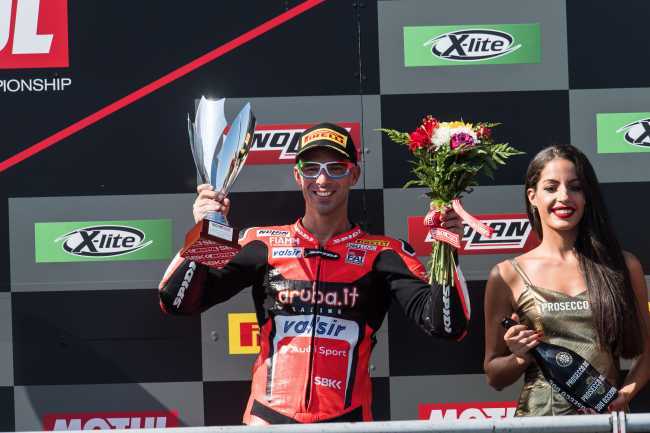 After a second-place obtained in Race 1, the Aruba.it Racing - Ducati team took another podium in Race 2 at Portimão (Portugal) with Marco Melandri, third on the finish line, only two seconds behind the winner at the end of a particularly balanced race, characterized by high temperatures with more than 40 degrees on the tarmac. Chaz Davies, who already dazzled the crowd with a brave comeback from 15th position Saturday, was once again fourth after leading the race for 11 laps despite an injured right shoulder. The Aruba.it Racing - Junior Team also rode a strong race with Michael Ruben Rinaldi, who significantly reduced the gap from the front to finish 8th, first among "Independent" riders. The Aruba.it Racing - Ducati team and the Aruba.it Racing - Junior Team will be back on track at Magny Cours (France) for the 11th round of the 2018 WorldSBK Championship, scheduled for September 28-30. "It was another tough race, though probably a bit more fun than the first one. I had a strong start but I struggled to make a few passes early on and I lost a bit of ground. Then I cut the gap from the front, but I had to ask a lot to the tires and eventually they dropped. In some corners I was struggling, while in others I was fast, but it wasn't enough to pass VD Mark or Rea because we were all lapping with a similar pace. In the end I'm very happy, we achieved the best possible results, obtaining the most from both the bike and myself. Hopefully this is a good sign for the future." "This was one of the most challenging rounds in my career, for sure. Portimão is one of the most physical tracks on the calendar and I haven't been able to train properly for a long time, not to mention the pain in the right shoulder. Honestly, if somebody would have told me that I would get P4 twice here, I wouldn't have believed it. Big thanks to my guys because we've made strides with the package through the weekend and we ended up actually quite close to the winners. Now we've got a few days to train and rehab ahead of Magny Cours to kickstart the final part of the season. I'm looking forward to the next race." "I'm very happy with today's effort, not only because of the final position but also because we've significantly improved our pace compared with yesterday, reducing the final gap. It's a shame I lost two positions in the final laps, we still need to improve a bit but I'm satisfied with our race. I want to thank my crew because they worked really hard on every single detail. We'll try to make another step forward at Magny Cours." "This round was certainly positive for us. Marco took home two important podiums, finishing both races close to the winner. Especially Race 2, which was particularly balanced. Chaz was incredible, going well beyond our expectations to finish twice fourth, a crucial result given his current physical conditions. Now we'll go to Magny Cours with one goal in mind: to take as many wins or podiums as possible and finish the season on a high note."